Joan Rivers, the undisputed queen of the red carpet was left out of was left out of the 87th Academy Awards In Memoriam segment. Reps for the Oscars tried to explain the omission by claiming time constraints, but fans are not buying it and remain outraged. The $100 million woman, Melissa Rivers, getting right to the heart of the matter after being approached and asked a question by a TMZ photog.. When asked about her one Christmas wish, Melissa simply said that all she wants is her son, 13-year-old Cooper to laugh again. 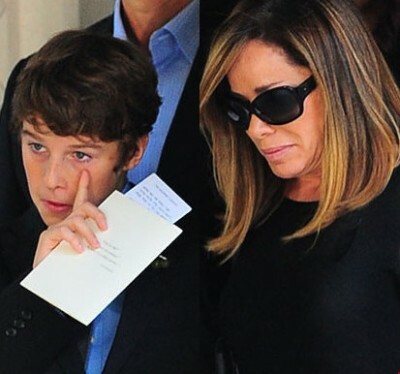 Heartbreaking..
Melissa Rivers has inherited a staggering $100M from her late mother Joan Rivers. Melissa ends up with Joan’s vast estate, after her mom died last month from surgery complications. 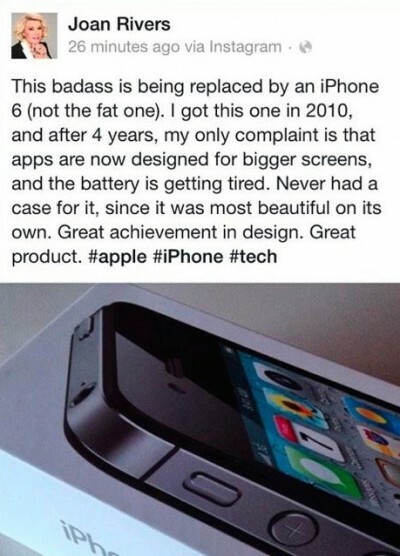 In a gaffe of ghostly proportions, Joan Rivers posthumously promoted the new iPhone on her Facebook. The eerie and downright creepy post, which appeared briefly on River’s Facebook page THIS MORNING, may have been a pre-negotiated deal with Apple or Steve Jobs is recruiting dead celebrities. Is This The Doctor Who Killed Joan Rivers? 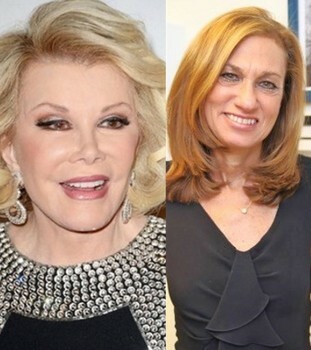 Gwen Korovin, is the doctor who began a biopsy on Joan Rivers‘ vocal cords that is thought to have killed the comedian. She even snapped a selfie while she was under anesthesia. Korovin, 55, performed an unplanned procedure directly before Rivers suffered cardiac arrest last month. 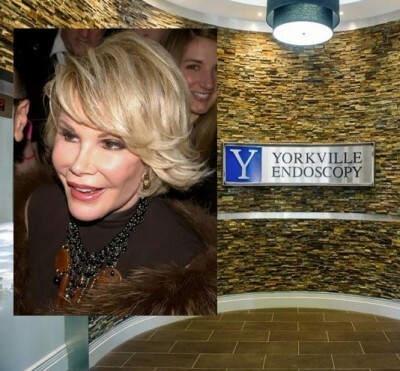 Doctors at the clinic where a botched Joan Rivers‘ procedure ended tragically, are being blasted after it was revealed they took selfies with the comedian while she lay unconscious. Rivers was undergoing an unplanned biopsy, performed without her consent, when something went terribly wrong, resulting in her death. Joan Rivers was supposed to undergo a routine surgical procedure, but that all turned deadly after a doctor, who arrived at the clinic with the comic’s entourage, stepped in and performed an unplanned biopsy on her vocal cords. The procedure is only to be carried out in a hospital. 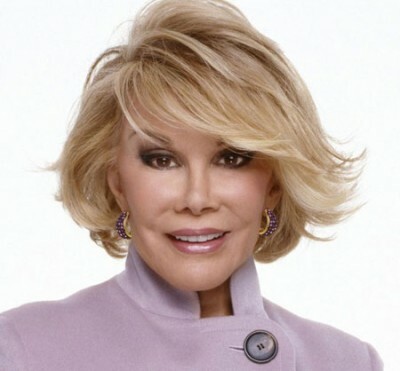 Joan Rivers once wrote to her daughter: “When I die (and, yes, Melissa, that day will come; and, yes, Melissa, everything’s in your name), I want my funeral to be a huge showbiz affair with lights, cameras, action….I want Craft services, I want paparazzi and I want publicists making a scene! It looks like Joan’s final wish has come true as a plethora of a-list-ish stars are at this moment attending her service. Joan Rivers‘ funeral will come complete with a celebrity style red carpet compliments of Temple Emanu-El synagogue. Guests will be invited to walk on the red carpet as they enter the synagogue to pay their respects. Rivers will then be buried with the carpet. Comedian, Joan Rivers has died. Melissa Rivers made the sad announcement moments ago. “It is with great sadness that I announce the death of my mother, Joan Rivers,” her daughter, Melissa Rivers, said in a statement.